Lego bricks were my absolute favorite growing up. It was the toy that kept changing and evolving with my imagination. There is so much that you can do with Lego bricks when you take into account all of the Lego Technic pieces that are out there. Gears, motors, axles and wheels all to be used in whatever creation your mind can think up. 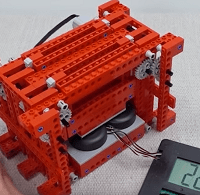 The YouTube channel Brick Experiment Channel tests the structural integrity of those Lego Technic pieces. In this particular video you can see just how powerful of a Lego “hydraulic press” can be made!